Pretzel rolls fresh out of the oven. I've had a couple of encounters with pretzel bread. First, my friend Debbie, who spent her adolescence in Germany, would talk about walking to the bakery and buying fresh pretzel rolls that were one of her favorite foods in all of Germany. Second, my friend Shana was craving pretzel bread after seeing it for sale at the grocery store. She figured she could make it herself and save some money, but when she did, she only met with disappointment. Of course, being the vain baker that I am, I took that as a challenge and I found this recipe at Two Bites in Suburbia. My first loaves came out perfectly shiny and well-browned on the outside; dense and soft on the inside. Mmmmm (see end of post pic). 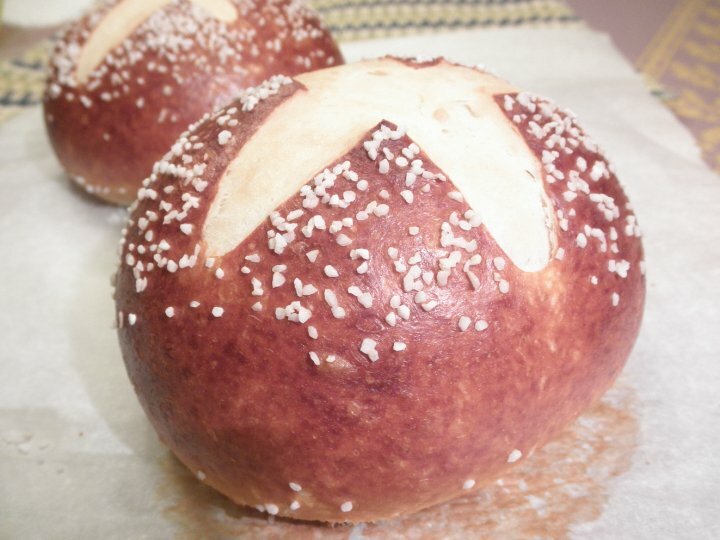 Because having a whole loaf of pretzel bread seems awkward, I turned them into pretzel rolls, like my friend Debbie described. 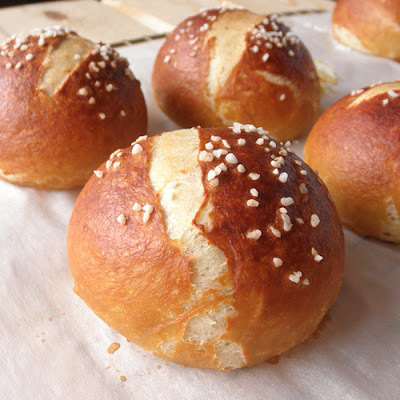 If you're into trying new yeast rolls, and you love soft pretzels, you've got to try these. So, so good. In the bowl of a standing mixer fitted with a dough hook, mix the flour, salt, brown sugar and yeast. Mix in 1 cup water, milk and butter until a dough ball forms, and then knead on medium low for another minute. The dough should form a slightly tacky, but firm ball. Cover the bowl with plastic wrap and let rest for 30 minutes. After 30 minutes, knead again for about 8-10 minutes. Place dough in a lightly greased bowl, cover, and let rise for one hour. Preheat oven to 400 degrees and bring the 4 quarts of water to a boil. When the water is boiling, slowly add the baking soda. Remove the dough from the bowl onto a floured surface and gently degas it. Cut dough into twelve relatively equal pieces. Form into balls and set on a lightly floured piece of wax paper. Drop balls three or four at a time into the baking soda bath for 30-60 seconds, turning once to guarantee both sides covered. Drain the excess water from the dough and place it on a parchment-lined baking sheet. Repeat with remaining dough balls. Sprinkle the kosher salt over the bread to your specific tastes, and use a sharp knife to cut a small incision on the top of the bread so the dough has somewhere to expand. Cook the bread for 18-22 minutes, or until deep pretzel brown, rotating the baking sheet once. Brush with melted butter, if desired. Remove to a cooling rack to cool. These freeze really well, and are a great little snack. Just pop one in the microwave for 30 seconds on 50% power, and it's soft and warm. The perfect pretzel bread that I can't replicate. Well, thank you, Jan! I'm so glad you're enjoying the rolls. :) I need to make more tomorrow myself. I hope the tortillas turn out too! I just got back from Germany....oh how I miss pretzels and the pretzel rolls....I am drooling just thinking about baking these! Can't wait to try them! How exciting!! Seriously, couldn't believe it when April told me you had figured out how to make my favorite pretzel rolls (aka "Laugenbretzel")from scratch. I'm going to have to surprise my family and bring some to our next get together. Your amazing! Love you lots, sweet friend. Missing your delicious experiments :) Hope you and your family had a good Christmas. I have made your pretzel rolls so many times, I had to buy a huge box of baking soda. They are so addicting. I even pulled out the inside of one and put my salad with blue cheese in there... :) so good..
Jan, it makes me so happy to hear that! I'm glad you're enjoying one of my favorites! I wanted to thank you for your persistence on getting this recipe right. I've just made them and they turned out wonderfully! And it's my first time ever making pretzels! So it's a double victory for me!!! Thank you from Israel and please keep updating your beautiful blog. You're welcome Ye'ela. Thank you for taking the time to make the kind comment. 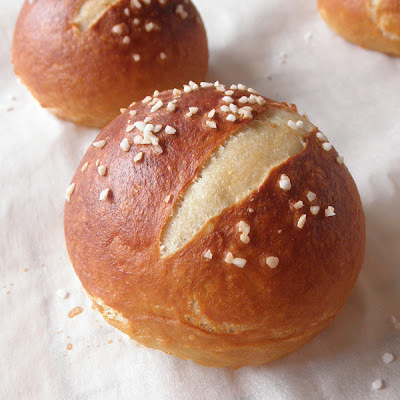 :) I'm glad you're enjoying the blog--and the pretzel rolls. Mmmm...Good luck with the soup recipe. Let me know what you find! this recipe is sooo dangerous is not even funny! I made these today and I have to say they came out so nice! I left them out to cool a little bit, went to take a shower and when I came back there were like 2 left no joke! My hubby was in the living room with our 5 and 3 year old daughters eating the bread! thanks for the recipe I will definitely be making these again! I have been looking for a fluffy chewy roll recipe. Will give this a shot. Just wondering if i can add a filling in the center too, will it work? I've never tried a filling with these, but I don't see why it would not work, as long at the filling can take the heat of baking. If you want to fill it after baking, I think that would NOT work because the inside would probably still be too dense in my opinion.